Sargenti, Azzurra Castiglioni, Sara Olivi, Elena Bianchi, Francesca Cazzaniga, Alessandra Farruggia, Giovanna Cappadone, Concettina Merolle, Lucia Malucelli, Emil Ventura, Carlo Maier, Jeanette and Iotti, Stefano 2018. Magnesium Deprivation Potentiates Human Mesenchymal Stem Cell Transcriptional Remodeling. International Journal of Molecular Sciences, Vol. 19, Issue. 5, p. 1410. This book, containing chapters written by some of the foremost experts in the field of magnesium research, brings together the latest in experimental and clinical magnesium research as it relates to the central nervous system. 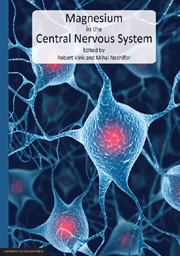 It offers a complete and updated view of magnesium's involvement in central nervous system function and in so doing, brings together two main pillars of contemporary neuroscience research, namely providing an explanation for the molecular mechanisms involved in brain function, and emphasizing the connections between the molecular changes and behavior.